The main objective of the canal was to improve the transportation of bulk manufactured goods and raw materials, particularly limestone from the quarries at Dove Holes, high up in the Peak Forest. Construction was financed by a joint-stock company formed in 1793 called the Peak Forest Canal Company. Money was raised by the sale of shares, these were mostly brought by local businessmen who expected the proposed canal to be beneficial to their trade. Samuel Oldknow, a prominent local industrialist was a major shareholder in this company and became the chief promoter and chairman. Oldknow, whose mill employed mainly women, recognised that as well as the direct benefits of improved transportation, the canal would provide employment for the men of the district. An Act of Parliament was necessary to enable the compulsory purchase of land, diversion of waterways and crossing of existing highways. Construction of the canal was authorised by an Act of Parliament (Act: 34 GIII c26) and given the Royal Assent on Friday 28th March 1794. Actual work on the canal did not start until two months later, on Tuesday 20th May 1794, the "effective" date of the act. The original plans show two flights of locks, one at Marple and the other at Buxworth rising 500 feet in five miles to the limestone quarries at Dove Holes. This latter section ultimately proved impractical due to the difficulties of providing the water necessary to operate locks over such a gradient. It was decided in July 1795 to terminate the canal at Buxworth (then called Bugsworth) and link it to the quarries by tramway. The Canal Companies' appointed Engineer for the Peak Forest Canal was Benjamin Outram, who was also responsible for the Ashton, Derby and Huddersfield Narrow Canals, all under construction or consideration at around the same period. He was assisted by his Resident Engineer Thomas Brown of Disley who, over thirty years later, was also Resident Engineer on the Macclesfield Canal. Canal builders would, as far as possible, always use local materials. In the case of the Peak Forest Canal, an ample supply of stone was readily available in the district and this was used almost exclusively in the construction of lock chambers and bridges. The canals were "cut" by gangs of men using picks, shovels and wheelbarrows. The skilled diggers were called cutters or bankers and the unskilled labourers, although soon they all became known as Navigators or "Navvies" for short. The locks were built by masons and the lock gates by carpenters or joiners. Miners were also used for the construction of underground tunnels and shafts, often using gunpowder to blast their way through the rock. Once dug, the canal had to be "puddled", which involved lining it with clay to make it watertight. Approximately three feet of "puddle" was laid on the canal sides and up to eighteen inches on the bottom if the canal bed was porous. Construction commenced in May 1794 at both ends of the Peak Forest Canal and at the same time the first stone was laid for the foundations of the Marple "Grand Aqueduct". The Upper Level of the canal, from Bugsworth to Marple was opened for traffic on 31 August 1796. The Peak Forest Tramway, which had been started the previous year, was still in construction, so limestone was conveyed between Dove Holes and Bugsworth using horse-drawn carts. Samuel Oldknow commenced construction of his lime kilns near Top Lock at Marple at this time and the first recorded delivery of lime was received on 31 July 1797. Work on the Lower Level between the Marple Aqueduct and the Ashton Canal stopped for a period in March 1797 due to financial difficulties. These were eventually overcome and the Lower Level as far as Ashton was finished in 1799. By this time the arches on the Aqueduct were keyed in and the work continued until 1800 when it was completed and water let in. The Aqueduct had taken nearly seven years to build and seven men lost their lives during the construction. 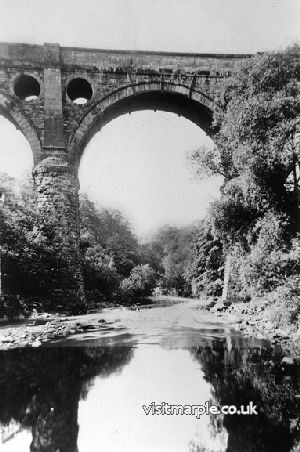 The Aqueduct is three hundred and nine feet across and rises over one hundred feet above the River Goyt, the whole structure contains 8,000 cubic yards of masonry. 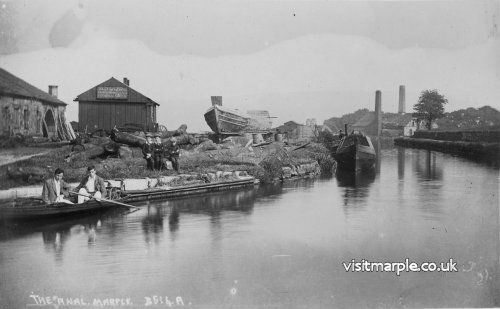 With continuing financial difficulties it had become apparent that there was nowhere near enough money available to build the proposed flight of locks at Marple. This was a serious problem as it meant that the canal could only be used in two separate sections, with no through traffic, making its usefulness strictly limited. This problem was overcome by the construction of a tramroad which started near Oldknow's lime kilns, ran across what is now Strines Road, cut across the corner of the present Recreation Ground and along the banking which can still be identified near the children's play area. From there it went towards the modern St. Martin's Road but turned to cross the canal at lock 10 near the Tollgate Cottage. The grooved support stones for the rails and the holes for the wooden pegs which held them in place can still be seen. The route then continued down what is now the towpath until it crossed "Back Lane" (now Station Road). The remainder of the route is no longer certain, but it seems likely that it followed the route of the access road to the Aqueduct Works on the opposite side to the towpath. The tramroad was nearly a mile and a half long and when first built was only a single track. The traffic was so heavy that it was working night and day and in 1801 the track was doubled. 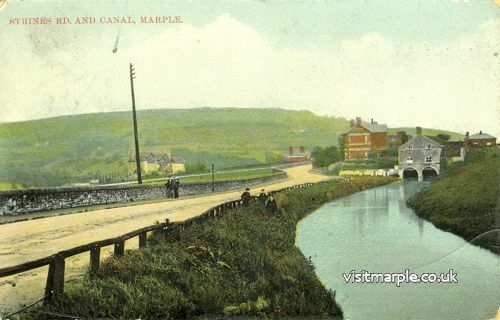 Around the same time as the tramway was doubled, the Canal Company began its efforts to raise the money to pay for the Marple locks. This proved difficult to resolve as initially Samuel Oldknow and Richard Arkright had agreed to lend most of the money, but Oldknow's finances were not in good shape and he was later forced to withdraw the offer as he would have been unable to honour it. Eventually, in August 1803, Arkright agreed to lend the money on his own and construction of the locks was finally able to commence. By this time Outram had left and Thomas Brown had been made Engineer. Each of the sixteen locks was constructed with a rise of thirteen feet, nearly twice the usual depth and the second highest in the country. The contractors were a company called James and Fox and the work was at last finished towards the end of 1805. A canal arm was constructed between Oldknow's lime kilns and the main canal, joining it below lock 13. This arm, which ran alongside Strines Road was filled in years ago but the blocked off tunnel that lead to it though Posset Bridge can still be seen. The story of how the bridge came by its name is well known, but worth repeating. It was built during the last stages of construction and Samuel Oldknow, who was anxious that one of his boats should be the first to navigate the locks, was concerned that it may not be finished in time. Oldknow encouraged the workmen by providing them with ale possets for breakfast. These were prepared at the nearby Navigation Inn and must have been a success as the bridge was finished in 1804, in sufficient time for Oldknow's boat "Perseverance" to make the first trip through the locks when they were completed. The Peak Forest Canal: Its Construction & Later Development by Olive Bowyer 1988 New Mills Local History Society. The Peak Forest Canal Marple to Whaley Bridge by Edward L.Hill - 1966 Gordon Mills. Oldknow's Warehouse & Historic Canal Boats - Mark Whittaker. For further information, including a "Virtual Trip" along the Peak Forest Canal visit the Pennine Waterways Website Main Entrance or go to the Peak Forest Canal Section directly.